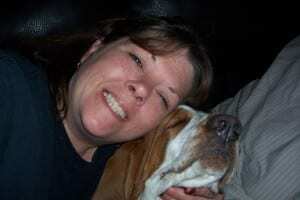 If you are owned by a basset hound, you already know that they are sweet,lovable,loyal,and easygoing dogs. They are also skilled hunting dogs. 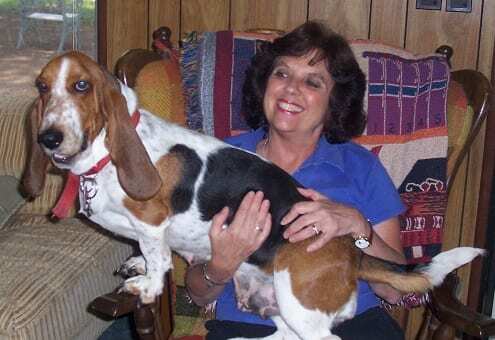 Originating in France,these”Low and Slow”hound dogs were once popular small game trackers (in fact, the word “basset” comes from the french word “bas”,meaning dwarf (or low) .With hunting on the decline in the US,the basset hound now barely misses making the AKC top 25 breeds,coming in at #28.To all of us basset hound familys they are second to none and cant imagine our lives without them! Basset hounds are typically pretty low energy,except when they pick up a scent. They live life by the nose. They are truly hound dogs enjoying the daily walk and play time picking up new scents, and if you are not careful….they will follow them. They love to follow there nose and wander. This can often mean that you call them and they dont respond. Proper training is essential. A fenced in yard is also important. 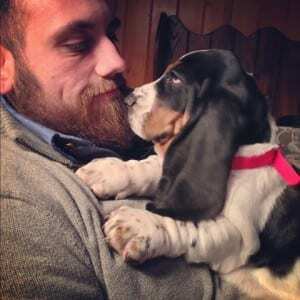 However ,the low energy basset can be perfectly happy in apartments and homes without fencing as long as you have the time to give your basset daily walks and excercise letting him explore. NEVER UNATTENDED!! I always tell people ..”please dont trust your basset”. 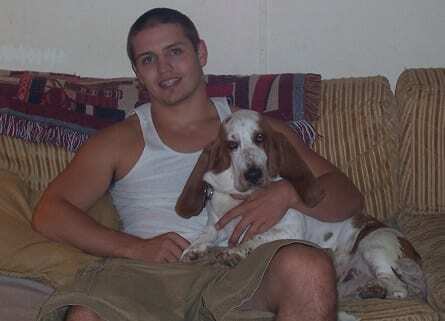 Opening up your door and letting your basset go out unattended without a fence to handle his buissness will eventually have you in a panic wondering “WHERE DID HE GO”??? Dog parks are a great option,but be careful letting your dog off leash in areas that are not enclosed. 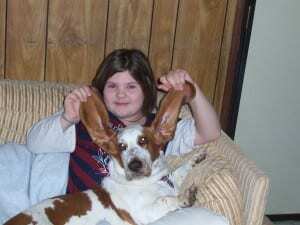 The Basset Hound is a short, relatively heavy dog. The head is large and well-proportioned with a rounded skull. The muzzle is deep and heavy with the length being greater than the width at the brow. The brown eyes have a soft, sad look to them and are slightly sunken with a prominent haw. The darkly pigmented lips have loose hanging flews and the dewlap is very pronounced. The skin hangs loose like elastic and falls in folds on the head. The velvety ears are set low and extremely long hanging toward the ground. The large teeth meet in either a scissors or even bite. The chest is very deep, extending in front of the front legs. The dog’s hindquarters are very full and round. The paws are big. The dewclaws may be removed. The coat is dense, short, hard or soft and shiny. There are no rules concerning color, but it is usually tri-color (black,brown,and white),or a bi-color. (red and white,mahogony and white,or lemon and white). 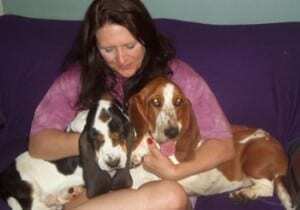 The Basset Hound is sweet, gentle, devoted, peaceful and naturally well-behaved. It fits into family life well. Its temperament should always be friendly, and never vicious, moody or harsh, and would only become so if the owners lead the dog to believe he is pack leader over humans. It is mild but not timid; very affectionate with its master and friendly with children. It can be a bit stubborn with meek owners and needs a firm, confident, and consistent owner who displays natural authority over the dog. Dogs need to know the rules of the house and have the humans stick to them. Bassets like to do tricks for food. They have a deep ,somewhat comical bark,or a howl!! Housebreaking can be a challenge, but they do well with positive reinforcement and patient, gentle training. With proper training, they are obedient, but when they pick up an interesting smell, it’s sometimes hard to get their attention, as they like to follow their noses and may not even hear you calling them back. Only allow your Basset off lead in safe areas. Panosteitis(a temporary lameness that can shift from one leg to another). Also known as growing pains!! Although he is generally healthy, the Basset is susceptible to several conditions such as glaucoma,obesity,gastric torsion , panosteitis, and allergies. His long back predisposes him to disc problems and can cause problems if he is overweight, out of condition, or jumps on and off furniture. He is also subject to von Willebrand’s disease, a genetic blood disease similar to hemophilia, and to elbow dysplasia. Panosteitis is a wandering lameness of unknown cause and cure. Puppies generally outgrow the condition by two years of age. Like other deep-chested breeds, Bassets should be fed twice a day throughout their lives to minimize chances of bloat and torsion. Bloat bowls are a good tool to slow down the overly anxious food hound! They should have a daily walk and a moderate diet to avoid problems with obesity.